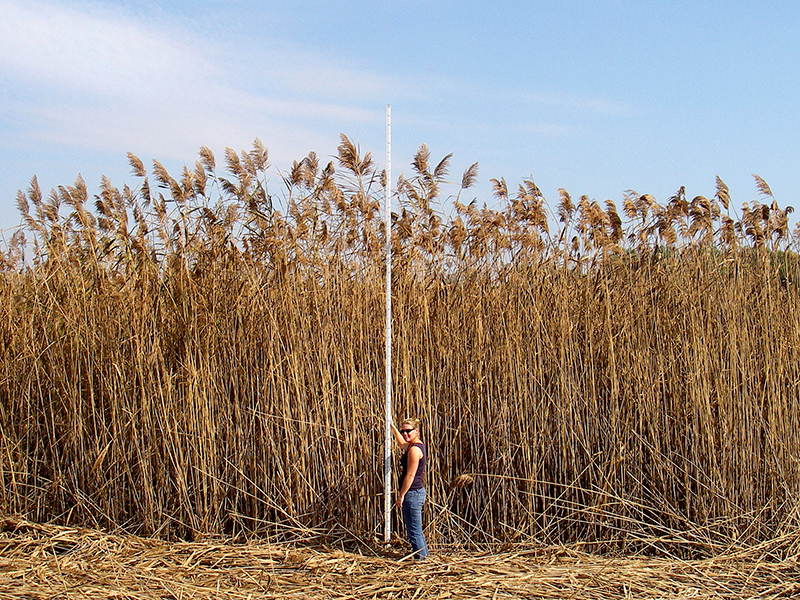 Invasive Phragmites is a highly invasive plant species now common in North American wetlands and along roadsides. It out-competes our native wetland plants like cattails resulting in decreased in habitat for wildlife. It thrives in disturbed habitats and prefers areas of standing water, but the roots can grow to extreme lengths, which allows the plant to survive in low water areas. Invasive Phragmites grows in dense stands which crowd out native vegetation, resulting in decreased plant biodiversity. It provides poor habitat and food for wildlife, impacting species at risk. Stands of dead, dry stalks of invasive Phragmites are combustible, and can results in fires. Its common along our roadsides and is causing road safety concerns. It also clogs drainage ditches, negatively affects agriculture, lowers property values, and impact recreational activities such as swimming, boating, and angling. Invasive Phragmites is found in all of the lower 48 states in the United States and in all Canadian provinces and the Northwest Territories. It has not been found in the Yukon or Nunavut. In Ontario, the plant has spread by almost 30% between 2010 and 2017 with over 5000 hectares (5 football fields) of strongly established colonies of the weed in the province. Virtually every region of Ontario has been impacted by the steady advance of this plant. Invasive Phragmites colonizes wet areas including natural wetlands and shorelines. It prefers standing water, but the roots can grow to extreme lengths to allow the plant to survive in low water areas. It also thrives in disturbed habitats such as roads, ditches and agricultural areas.